Every single working day for the last 15 years, ‘Music for Health’ has been constantly receiving the most amazing evidence that ‘Music for Health’ group interactive workshops really work. Today more than 30,000 Residents are helped every month by the ‘Music for Health’ method. ‘Music for Health’ workshops are able to help groups of residents – usually between 7 – 20 people per workshop – making it a considerably cost effective therapy session for the Residential Homes involved. This across the board effectiveness is achieved because each workshop has been vibrationally balanced. This is a bit like having all the right ingredients to make a cake. So whatever label life has given the Residents participating in a MFH workshop – they will be helped – they will at the very least be happier, although everyday miracles have been and are experienced by all our team on a regular basis. Not only is every workshop vibrationally balanced, but the music used is also adapted for purpose, e.g. many pieces used would be too long, hence too tiring. Many pieces start at a very low sound level, consequently many Residents with differing degrees of auditory ability would miss out, so these levels are increased without compromising the piece, meandering sections would lose the focus of many residents so these are removed by the incredible skill of our technicians at the MFH recording studio at the registered H.O. in Chichester. Little known verses of songs are also removed. Thousands of recordings are listened to so that only the very best on all levels get into ‘Music for Health Complete Workshops’. 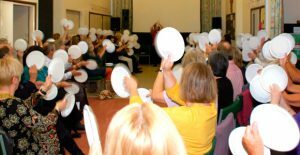 Because each and every workshop is perfectly balanced and made for purpose then recorded onto CDs for the MFH team to use, the magic ingredient behind ‘Music for Health’s success is the music. Even if a ‘Resident’ is unable to participate on any physical level, they will benefit from the re-balancing effect of the music. Each perfectly balanced CD comes complete with an accompanying colour coded ‘Workshop Sheet’ that is structured to a particular workshop. Interaction is the key that makes ‘Music for Health’ revolutionary workshops mean so much to the Residents taking part. The Residents really feel that they have a stake in what’s happening, that their input is important and the most important thing of all, Residents in a MFH workshop know that they are still valued, appreciated and respected – also extremely important is that Residents, Staff and the MFH team all have a most enjoyable, party atmosphere time. Only the most glass half full, reliable, kind, outgoing, active, patient people with a great sense of fun are suitable to become members of the ‘Music for Health’ team. They must be able to stand in front of large groups of people, leading them in an enthusiastic but kind way. Consequently ‘Music for Health’ has to be very picky about its team. MFH new team members need to be looking at, at least a couple of years, preferably longer service. The very first recruits to ‘Music for Health’ who joined us in 2004, Margaret and James, Eastbourne; and Jenny and Tessa, Arundel, are still part of the team. Residents abhor change and become very fond of the people leading the workshop (it goes both ways) so it is in the Residents interest to have as stable an ongoing as possible. After interview, checks and references prove satisfactory, new team members undergo a very intense 10 hour training day, in which every aspect of delivering the balanced and structured workshops is taught. Special attention is also given to how best to interact with Resident dementia. ‘Music for Health’s’ team need to have an unusual blend of abilities. If it is found during a training day that any recruit is struggling in any aspect, they will be offered additional training and if that does not put them on the right path – they will be given their money back. The workshops themselves provide continued training, as a team member learns to feel when a workshop is in balance. (Each and every workshop has on it several choices – all in balance). Eventually a team member can instinctively know which of the balanced options would be the most perfect balance for the unique group of people sat before them. When this completely perfect balance happens – it is a workshop experience beyond imagining. Don’t get too excited though, we all still have the very occasional ‘Beam me up Scotty’ day. This is the title given when ‘Music for Health’ is happy to include you on the team – that no musical knowledge is required. 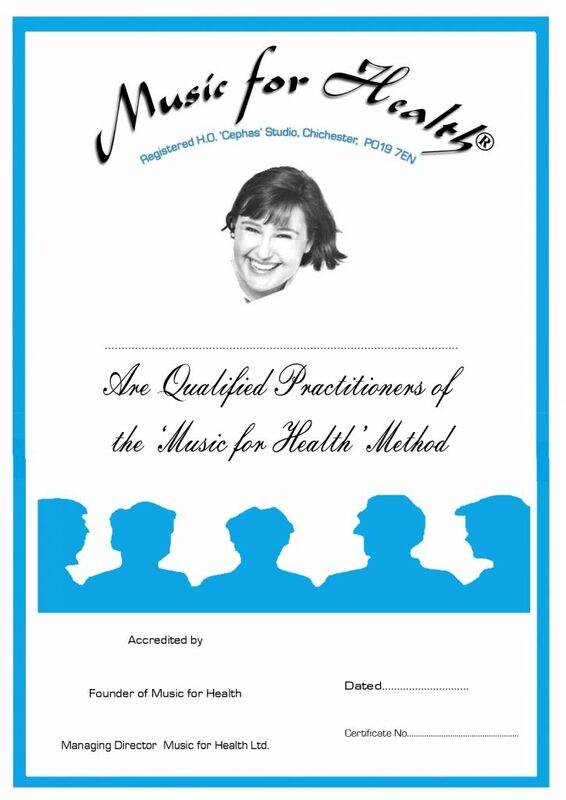 Local Directors who satisfy all the criteria, become a ‘Qualified practitioner of the ‘ Music for Health Method’. An impressive certificate is given to make this official.